Following a discussion with Tom Eugelink author of a Calendar control for JavaFX I’ve decided to have a try at styling it with a Metro like style. 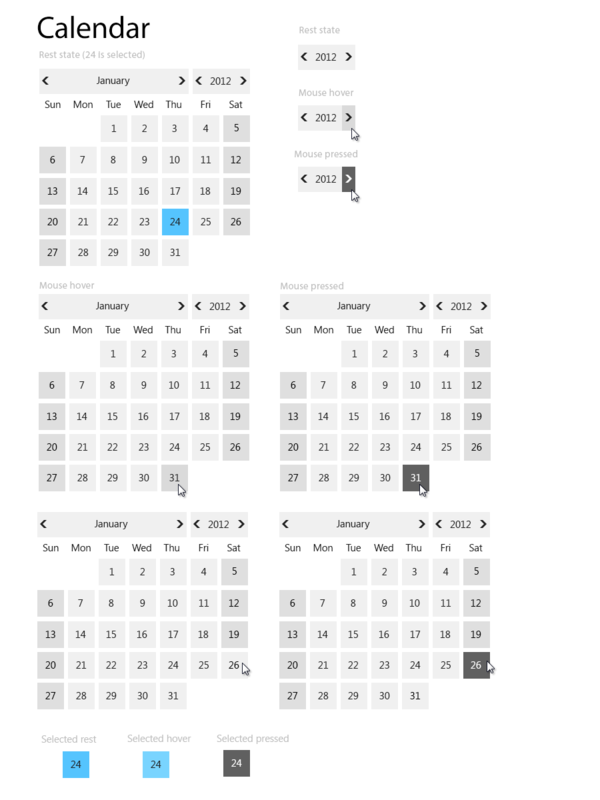 There is no Calendar control or spinner control, which is used in Toms Calendar, in the windows 8 (metro) toolkit of controls, so I had to come up with a fresh new design for this. Actually the ComboBox of Metro behaves a bit like the spinner control of ios but still it’s not like the spinner control of previous Windows versions where you have up and down (or left and right) arrows to slightly increment/decrement the values. I also had touch in mind, so the increment/decrement buttons in the spinner are far apart enough to not be accidentally touched instead of the other increment/decrement button you aimed for. I’m interesting in JavaFX, is there any tutorial to make custom components from scratch!? There are several tutorials on how to create custom components.